BACKGROUND: Acquired defects of the cranium represent a reconstructive challenge in patients with calvarial bone loss due to trauma, infection, neoplasia, congenital malformations or other etiologies. The objective of this study was to compare postoperative rates of infection, local complications and allograft failures following cranioplasty reconstruction using Titanium Mesh (Ti), Polymethyl Methacrylate (PMMA), Polyether Ether Ketone (PEEK), and Norian implants in adult patients. 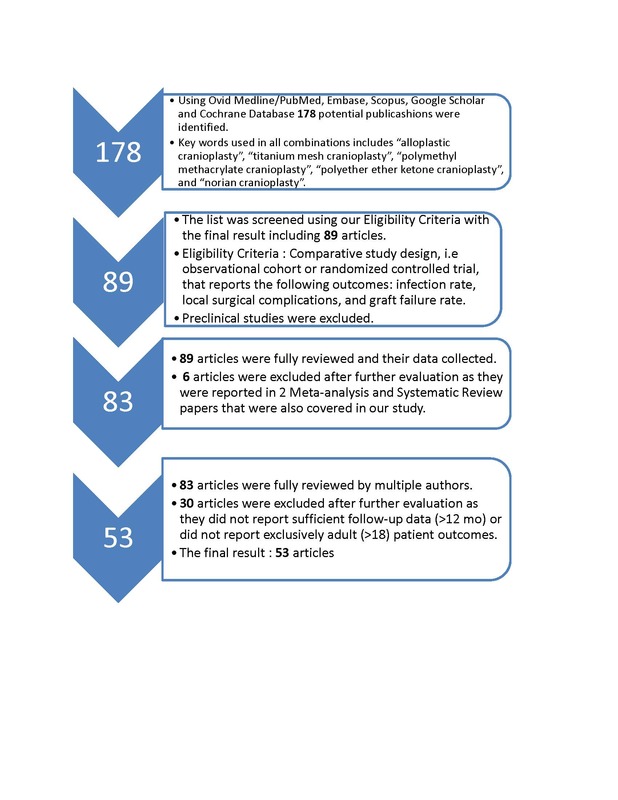 METHODS: This constitutes the first systematic review of available literature on four different methods of alloplastic cranioplasty reconstruction, including Ti, PMMA, PEEK, and Norian implants, using the Newcastle-Ottawa Quality Assessment Scale guidelines for article identification, screening, eligibility and inclusion. Electronic literature search included Ovid Medline/PubMed, Embase, Scopus, Google Scholar and Cochrane Database. Pearson's exact test was utilized at p < 0.05 level of significance (J.M.P. v11 Statistical Software). RESULTS: A total of 53 studies and 3,591 patients (mean age= 40.1 years) were included (Ti=1429, PMMA=1459, PEEK=221, Norian=482). PMMA implants were associated with a significantly higher infection rate (7.95%, p=0.0266) compared to all other implant types (6.05%). PEEK implants were associated with a significantly higher local complication rate (17.19%, p=0.0307, compared to 12.23% in all others) and the highest ultimate graft failure rate (8.60%, p=0.0450) compared to all other implant types (5.52%). CONCLUSIONS: This study qualifies as a preliminary analysis addressing the knowledge gap in rates of infection, local surgical complication and graft failure in alloplastic cranioplasty reconstruction with different implant types in the adult population. Longer-term randomized trials are warranted to validate associations found in this study.